Welcome to the 2012 Google+ Awards! We are here tonight to honor brave pioneers in social media, those brands willing to explore an empty space, to engage civilizations of software engineers , web developers, and other alien life forms, and to boldly go where only men have dared go before. Yet even in the face of these considerable perils, there are some that have brazenly staked the virtual earth with their logo-flying flag. They have fortified their profiles, enCircled a following, and courageously let it all Hangout. In short, these are the corporations, non-profits, and NGO’s that are rocking the plus. Our elected committee of social media experts, rocket scientists, and Nobel laureates has carefully reviewed tonight’s nominees. The winners will be awarded live right here on this scheduled blog post. The Most Popular Award goes to the Google+ Page that has the most followers. Just look at the size of those… circles. With over 2.5 million followers, UK based chocolate company Cadbury was one of the first to break the 2 mill mark. It uses its Google+ page to post tantalizingly delicious product updates, receive feedback from customers through Hangouts, and offer exclusive sneak peeks to its followers. Our Most Engaging nominees are experts at giving their followers what they want. 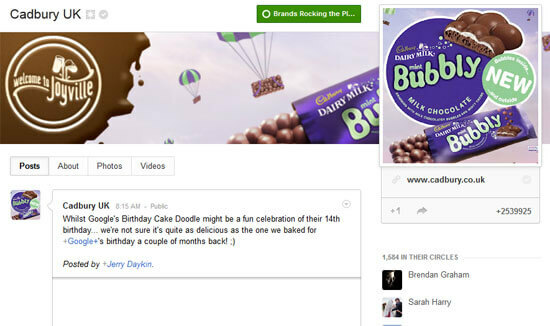 They earn more comments, shares, and +1’s per post than almost any other brand. 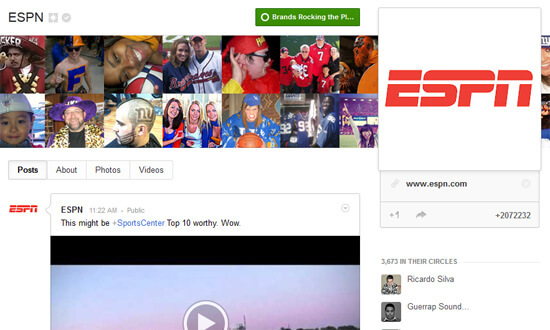 ESPN highlights the best moments in sports through expert commentary, high-def photos, and a bit of humor. They also host hangouts with athletes and some of their most famous anchors. This week they averaged 95 comments, 39 shares, and 286 +1’s per post. Our Best Content Award is given to a page that provides a great resource of information. Tonight we honor those brands that seek to educate, inform, inspire, or entertain through Google+. 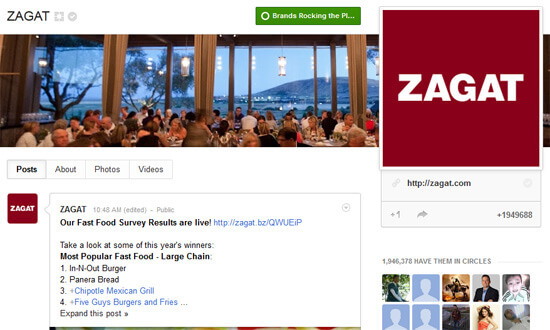 In addition to posting restaurant reviews and recipes (complete with mouth-watering photos), Zagat offers Hangouts with chefs, travel guides, and resources for good nutrition. They check in regularly with their followers through surveys and promote community groups as well as national charitable causes. The Best Design Award is given to a page that would wow the judges at a beauty pageant (even without the swimsuit round). These brands excel at first impressions. 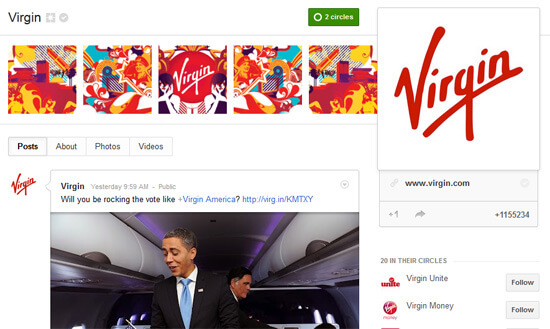 For its animated scrapbook photo banner and attention to detail, Virgin has the most aesthetically pleasing Google+ page. We were sorry to see the scrapbook photo banner get phased out this summer. Our final category gives special recognition to the charity organizations, non-profits, and NGO’s that have chosen to make Google+ a battleground for their cause. 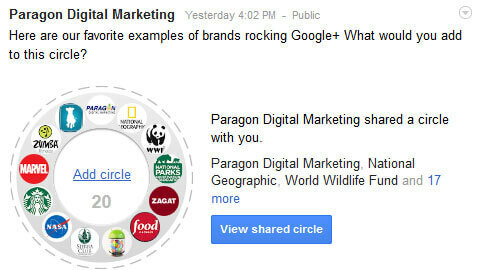 Here are the nominees for the Best Brand with a Cause on Google+. 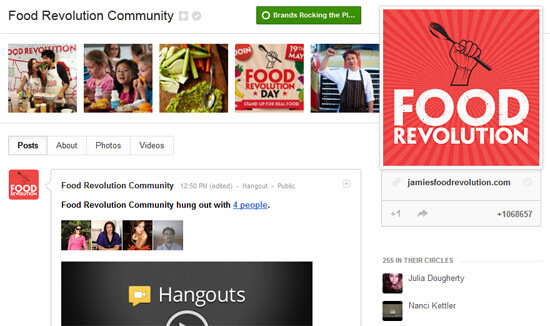 Using regular Google Hangouts to get people from different stakeholder groups talking, Jamie Oliver’s Food Revolution is effectively promoting healthy nutritional choices through Google+. The page also has over a million followers. Thank you to all our participants and our judges. On behalf of Paragon Digital, I want to encourage you all to keep rocking the plus!